London, 1680. The famous philosopher, Sir Robert Boyle, is about to demonstrate the results of his investigations of the phosphorus and its cold fire to fellows of the Royal Society and other guests. Far away at the edge of Wales an alchemist learns of the discovery and, helped by his young assistant, attempts in his own way to form the mysterious material, little suspecting that his work threatens to open the universe to the evil power of the Malevolence. Summoned by the Brains, September, the Cludydd o Maengolauseren, arrives charged with halting the Malevolence’s storm of destruction. But how? She finds herself out of her time and in a world not quite her own. Nevertheless her experience of the Malevolence tells her that she must do something. The fantastic beasts she encounters may come to her aid, if she can work out how to save them from the Cold Fire. For September, hardly any time has passed since she was trying to save Gwlad in Peter R. Ellis’ thrilling fantasy series Evil Above the Stars. Now, in the first of the September Weekes novels, she appears to be closer to home, at least in space if not time. But not everything is as she’d expect it, and she still seems to be wearing her school uniform! Combining science, fantasy and adventure, this is a novel truly worthy of the designation Speculative Fiction. 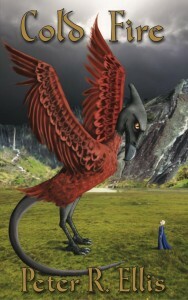 The cover design by Alison Buck shows us September meeting one of the fantastic beasts, the dragon Obsidian. Cold Fire was published in a digital edition on 4th August 2017 and in a paperback edition on 9th October 2017.